As a local business in the Heights, we're all about supporting other homegrown business owners in our community. This past week, we got to catch up with the owners of Bone on the Bayou, Laura and Michael Englishbey. This family owned and operated doggy daycare was established in the Heights in 2008 and has been flourishing ever since. Bone on the Bayou began as 20th Street Grooming and Doggy Daycare inside a 1920s styled bungalow. However, just last year they expanded into 3 bungalows along the corner of N. Shepherd and 20th street. "As the Heights grew, we grew," said Laura. "There have been several requests for us to open another location." The owners of the grooming and daycare company have been debating for years whether a second location should be opened. And all though nothing is set in stone, the Englishbeys are open-minded to the idea, which is one of the reasons for their recent name change. "About three or four years ago we started thinking about the name 'Bone on the Bayou,' and that kinda just came to us as we were sitting in a cajun restaurant," said Laura. "And within the last year we said 'OK we're doing this.'" The Bone on the Bayou owners were sure to mention that nothing is certain yet but chances are likely that a second location could be happening. No matter the name, the three '20s style bungalows are typically bustling with dogs of all sizes. For each visit, every four-legged friend is greeted with a familiar face and the cozy, "at home" aesthetic makes the dogs feel more comfortable compared to any other grooming or daycare service in the neighborhood. Olive + Main Team Leader, Jena Turner trusts the team at Bone on the Bayou to care for her own pups. 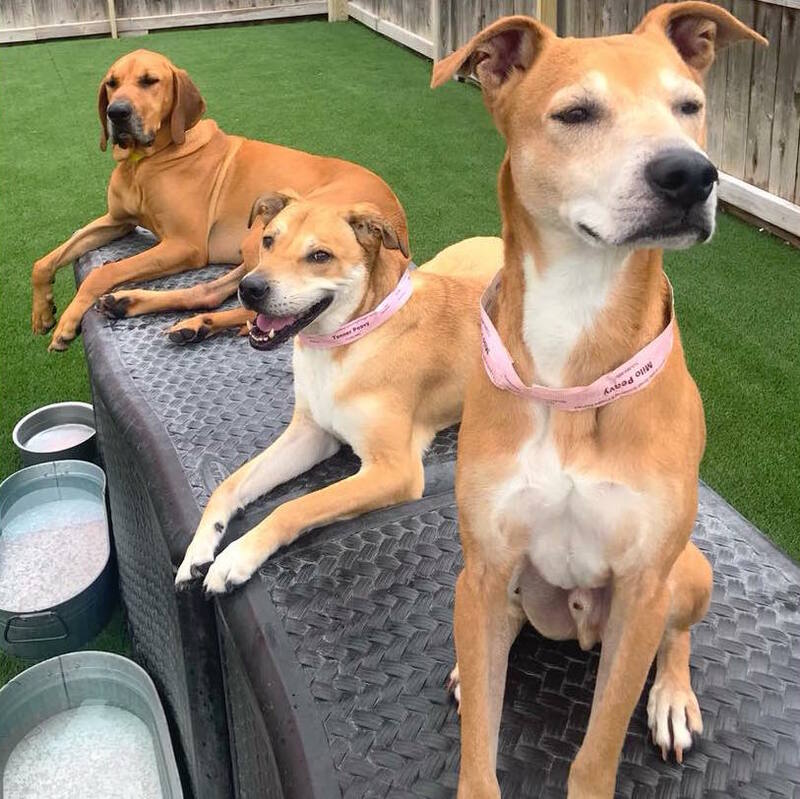 "Our dogs just love the staff and the play time at Bone on the Bayou," said Jena. "We often joke that they like it there better than at home with us, which is likely true!" “We will take them back and we’ll just start daycare. They play all day. The only time the ‘kids’ are in kennels here is at night and when we feed them. The rest of the time all day they’re out and about playing,” said Laura. And despite their growth, the intimacy of a home away from home is what the staff at Bone on the Bayou strive for on a daily basis. And that's what keeps customers coming back. "We want to stress to people that we're not going anywhere," says Laura. "Nothing has changed. We're not going to be too big and lose sight of the intimacy. We're never going to be so big that we don't know the customers and the dogs. It's just what makes us feel happy."